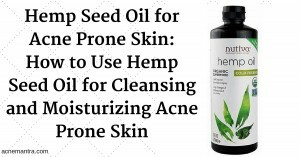 If you’re looking for information on using hemp seed oil for acne, you’re in the right place. Lately hemp seed oil gained popularity for use on acne prone skin as a cleanser and moisturizer. Read on to see if this oil is right for your type of acne and how to use it. You will also find brand recommendations for hemp seed oil. This oil is made from cold-pressed hemp seeds. It’s light green in color and very smooth. In recent years many people have been using hemp seed oil for acne treatment, as it is rated at a 0 on the comedogenic scale). This rating does not mean it’s incapable of clogging pores, but it is highly unlikely. Is Hemp Seed Oil Comedogenic? Can hemp seed oil clog pores and cause breakouts? To see how hemp oil measures up to other products on the comedogenic scale, check here. While you might be skeptical that oil can help your pores, especially when it’s common knowledge that skin oil is the cause of most acne, it’s important to remember that not all oils have the same molecular structure. The structure of hemp seed oil is smooth enough with larger molecules that won’t clog up your pores when you use it on human skin. Hemp oil has anti-inflammatory and antioxidant properties that can help to renew and heal your skin when you apply it. It also acts as a wonderful moisturizer for your face. One reason you can use hemp oil for acne is because it contains high levels of the same compound as your skin oil, linoleic acid. Applying this acid on your face can help your body calm down its own over-production. When the skin does not have enough linoleic acid, more oil will be sent through your pores with a greater chance of clogging the pore. If enough linoleic acid is already present on the skin, the body does not make as much skin oil and less oil will be sent through the pores, reducing the risk of clogs. Hemp seed oil is best used with an oil cleansing method or as a facial moisturizer. You can do the oil cleansing method with two slightly different variations. The first and main method is to take between 1tsp and 1tbsp of hemp oil (vary based on how oily your skin is naturally) and apply it to your face as you would a soap. There’s no real need to massage it in, although some people like the feel of the oil on their skin. After applying the oil, take a clean hand towel or rag and run it under very warm water. Wring out excess drips and let the warm towel rest on your face for 1 minute. Remove it before using a clean towel to gently wipe off the oil residue. If this method is too hard on your skin, you can rinse the oil off with warm water instead of a warm towel. You should still use a towel to dab off excess water and oil from your face. 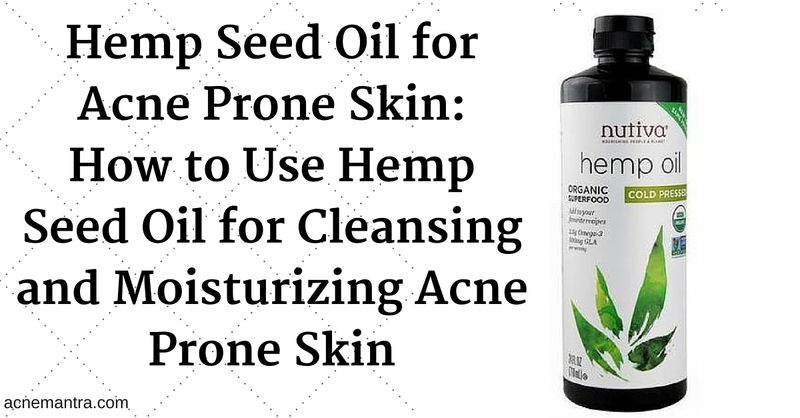 Using an oil cleansing method with hemp seed oil can prepare your skin for exfoliating. It cleans out the pores and softens skin so that exfoliation won’t be too stressful for your face. If you want to exfoliate, you should do it after cleansing. You may even want to cleanse or moisturize with the oil again afterwards. Hemp seed oil can be used as an effective moisturizer for those with normal or low levels of skin oil. Some with high levels of skin oil will not be able to use this oil well, although it can actually help to regulate oil levels on your face. It’s best to moisturize after you have washed or cleansed your face. If you’re going to use the oil cleanse method, you can still use hemp oil as your moisturizer to because of its acne-fighting properties, although some people have said this is too much oil and it does not work well with their skin in these amounts. You can also apply the moisturizer after simply washing your face off. To apply this oil as a moisturizer, you only have to put a small amount on your hand and rub it onto your face. Let it sit for at least 15 to 20 minutes so that it can soak in properly. After it’s well soaked, you can take a clean towel to wipe off the excess oils. You may feel a small layer still on your face, which is ideal as it can help protect your skin as well. If you’re using a strong acne product such as benzoyl peroxide, hydrogen peroxide, or other more harsh products you can use a hemp oil moisturizer to compensate for the moisture loss. Besides using hemp oil for acne as a moisturizer or cleanser, you can use it to remove your make-up. It’s a soft and non-harsh way to rid of your excess make-up. Hemp oil is delicate on the skin and can bind to the cosmetic particles to remove them safely, even waterproof make-ups. Apply the oil to your face over all areas you wear make-up. Let it sit for at least 30 seconds before rinsing off. You can then wipe your face with a clean towel to remove any oil residue. When looking for hemp seed oil for acne, try to find organic, unrefined, and cold-pressed oil. It’s ideal for it to have a dark colored glass bottle for storage in a cool and dark place, such as the fridge. You’ll find this is the top brand of hemp seed oil available in the US. It’s widely trusted as a good source of natural hemp oil for your skin. This brand of oil is intended for cooking, but it’s perfect for use on the skin as well. This is another good quality unrefined, organic, and cold-pressed oil. Should You Try Hemp Seed Oil? Using hemp oil for acne can be an effective solution for some people, but it might not work for moderate to severe acne nor for those with very oily skin. Otherwise, it’s a great natural product to apply to our skin as a cleanser or a moisturizer.